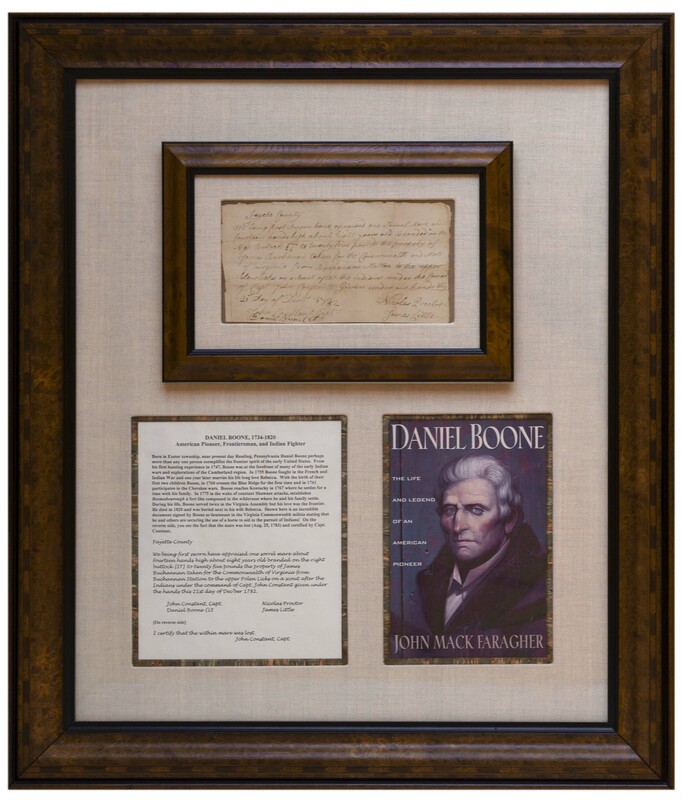 Important Revolutionary War document signed by Daniel Boone regarding one of the last battles of the Revolutionary War where Kentucky militiamen were routed by Native American forces allied with the British in the Battle of Blue Licks. 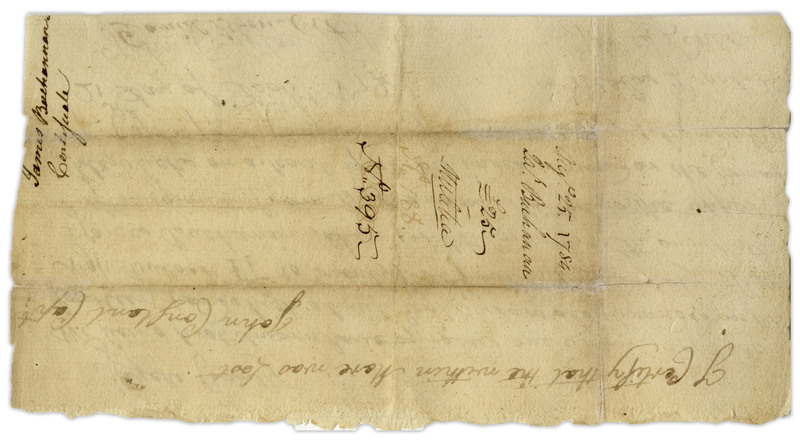 Dated 21 December 1782 from Fayette County, Kentucky, where the battle occurred, document reads in full, ''We being first sworn have appraised one Sorrel Mare about fourteen hands high about eight years old branded on the nigh buttock ET to twenty five pounds the property of James Buchanan taken for the Commonwealth and State of Virginia from Buchanans Station to the upper Polen Licks on a scout after the Indians under the command of Capt. John Constant given under the hands this 21st day of Dec'ber 1782.'' 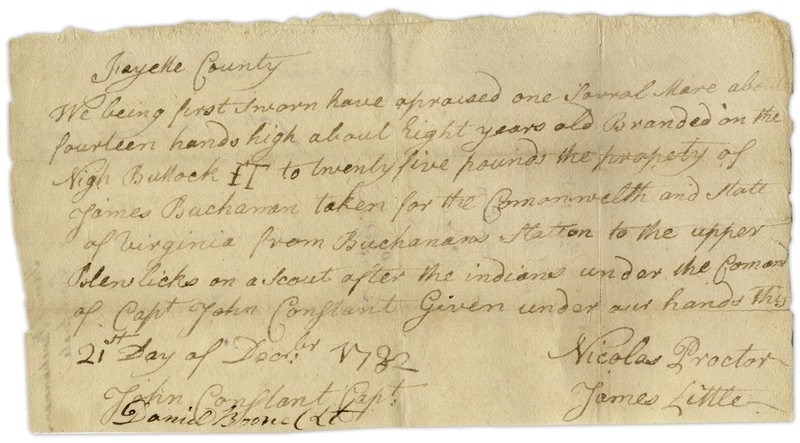 Document is then signed by ''John Constant, Capt. '', ''Daniel Boone (Lt.'', ''Nicolas Proctor'' and ''James Little''. Congressional records show that a bay horse owned by Buchanan was lost during the infamous raid on the American encampment at Bryan Station, which precipitated the Battle of Blue Licks. On 15 August 1782, Native American forces laid siege to the camp, killing the livestock and destroying crops, which in turn led the Kentucky militiamen, including both Boone and his son Israel Boone who died in the battle, to the battlefield where they were greatly outnumbered by British allied forces; of the 182 Kentucky soldiers fighting, 72 were killed and 11 captured. 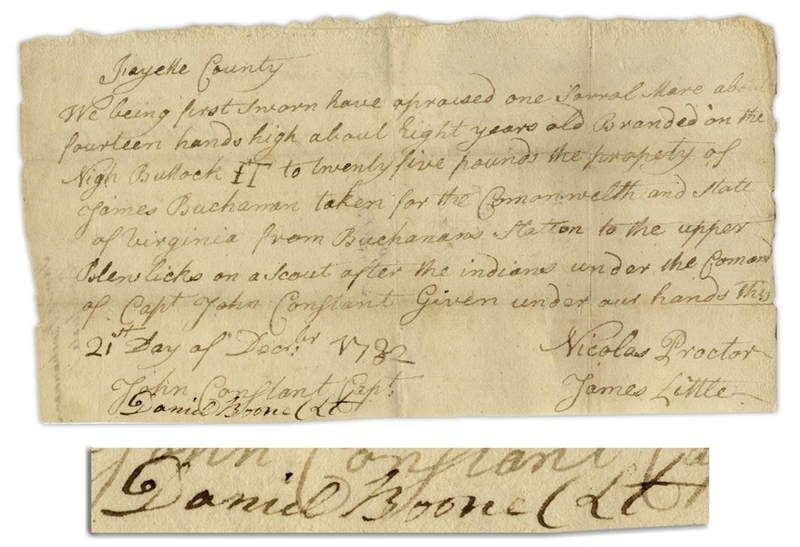 After the battle, Boone and others submitted claims to recover lost property, which Congress approved. Document measures approximately 8.25'' x 4.5'' with uneven edges. Folds, with archival repair to verso, neither affecting Boone's bold signature. Very good condition. 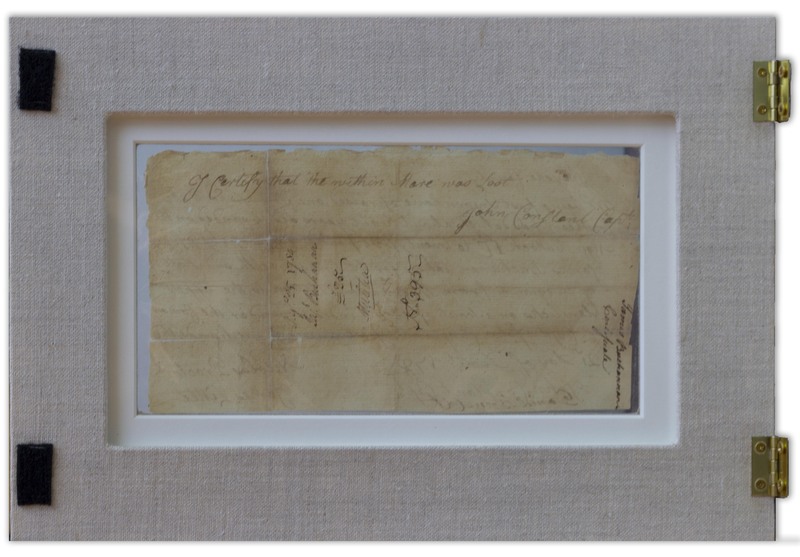 With RR Auction provenance, lot 181 of their 15 October 2014 sale.